Dr. Spades is originally from Walnut Ridge. He Received a B.S. 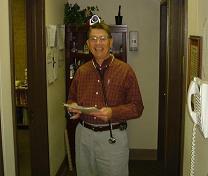 in Biology from Hendrix College then got his degree in medicine from the University of Arkansas for Medical Sciences. His postgraduate training was completed at St. John’s Hospital in Tulsa Oklahoma. He then spent two years practicing at Little Rock Air Force Base before returning to Walnut Ridge and joining the Lawrence County Family Clinic in 1974. Dr. Spades enjoys hunting, fishing and studying computers. He also enjoys visiting with his family, church and community. He is happily married to Rose Snapp Spades and has one daughter and 2 sons.